There are so many people here having issues with using proxies with WRobot. I'm going to write a thorough guide here, that will get you set up. This subject has been discussed a lot. A proxy will not make it, so you are not banned. It will make sure that WHEN you are banned, only the char using that proxy is banned. I am using "WHEN" because, you will always get banned at least once if you use bots. There are many kinds of proxies, but the most common are HTTP & Socks5. HTTP: A HTTP proxy will ONLY handle HTTP traffic, this is where many people go wrong with wow. 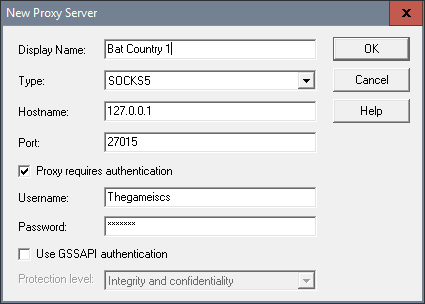 use a socks proxy. I am personally using ProxyCap, it's easy to set up and it has a simple interface. I suggest getting a paid proxy. There are many sites out there to get proxies. Using a free one, has a bigger chance of getting you banned. Try and get a private, and you will be good. Proxies For You is what i use. 1. Open your wow folder. 1. Install ProxyCap & Restart your PC when prompted. 4. Click the "New Proxy Server" icon (This does not have any text, but is a white logo with some gold on top) It's in the top right corner. 6. Make sure type is set to Socks5 (should be standard). 7. Write your IP address in Hostname (I.e. 127.0.0.1) <- This is localhost, don't use that lol..
8. Write your port: (I.e. 27015) <- Guess a game..
9. If you have locked your IP with a username and password, Enable "Proxy requires authentication" and write in username and password. 12. Click the "Quick Add Rule" icon (This does not have any text, but is a white logo with some gold on top) It's in the top right corner. 13. Make sure Rule Action says "Redirect through proxy". 17. Under Transports Check TCP and UDP. If you start your game through that exe file it will run through proxy. A nice way to check if it works, is by replacing your IP in Proxies with something random. Try to connect to a server, if it does not connect with a random IP address that is not working, it will not get a connection. This means the exe file is running through proxy. Another way is by double clicking Proxy Cap icon. If your game is in the list, you know that it's going through a proxy. This way works with Relogger! 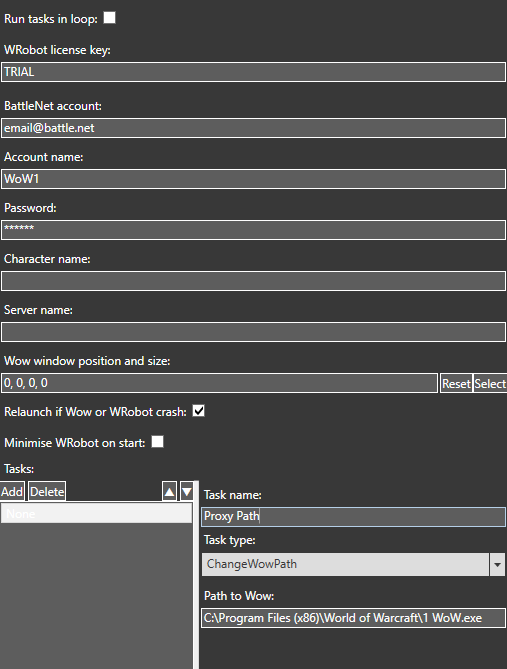 In your relogger under Tasks, click add and choose ChangeWoWPath and change your Path to Wow: so it fits with your new proxied wow file. Hey Ordush, thanks for the guide! I'm considering using your method and I checked the proxy provider you linked. Do you think using IP replacement/month is useful when botting? Well it really depends on how the server behave on banning. If you end up getting banned, AND they decide to IP ban you. Then you need to replace the IP's. However, on all the servers I've been banned on, for some reason they have never IP banned me. Followed you directions exactly and i'm getting following error: "Connection not allowed by ruleset (2)"
Im having HTTPS proxies and they also cover my game preety good. When I log into realm website it says "last online from Sweeden for example" that means https also should be good for wow. 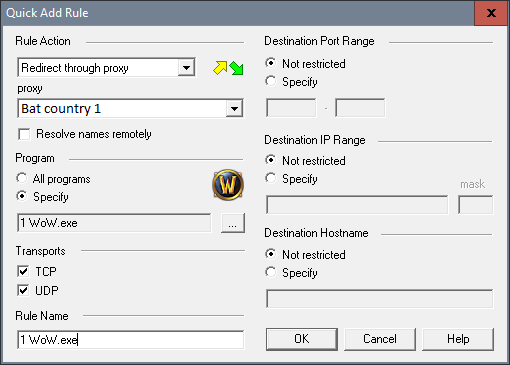 Then why my Proxycap shows result in sending and recieveing internet for my wow windows. Also when I forgot to pay proxies for next month, i couldnt even log into accounts because proxies were replaced, but when paid instantly could log again into accounts. If you want I can send you one or two proxies so you can try it all. 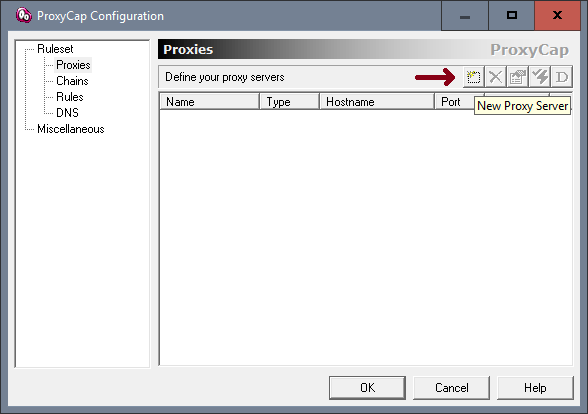 So if I understand correctly, by geeting a Socks5 proxy, I can use it to create an account on the website AND use it for the WoW.exe? Or do I have to get a HTTP proxy to create the account and a different Socks5 proxy to play? Sorry if it sounds dumb I'm kinda new with all this haha. Ok great, thanks I'll try setting up a proxy during the week. I don't know if it's the right topic but regarding in-game behavior, I imagine you would suggest to avoid any contact between the botted chars and the "real" chars? What I mean by contact is sending gold, killing a few elites etc. The underlying question is: do you know of any GMs who would ban the accounts the bot had exchanges with? Hard to tell honestly, but probably not. How do you identify the port of WoW.exe plz? Using WRobot? If so, should it not change everytime you launch WoW.exe? Im getting error message "Connection refused (10061)" whenever i try to launch through the proxy. Any idea what could cause this? Edit: i think it's because my port keeps changing but i have no idea how to stop it from happening. ok, is the username and password for my internet or for my PC? i didn't quite understand in the guide you wrote. it can't be the username and password for my wireless right? Because that's the only one i can think of. oh i missed that step 😛 i got it now thanks! Hey this guide is written really well, works good for me. I wanted to ask if there's a way to register new accounts on servers through the proxy I bought? Well, isn't it unsafe to register new accounts to bot on from the same IP? If one gets banned can't server admins check the IP that registered it and just ban all of the accounts that were created from that IP? So I want to for example go on warmane's site through my proxy, register a new account so I don't endanger my other accounts (I use exact same things as in this guide, ProxyCap and ProxiesForYou).